Un paiement immédiat de 19,99 $C est requis. I do consider The Walking Dead season 8 to be the weakest season of the series but if you want to complete your collection it's a very good bargain. One problem I do have is that the case is cheap and one of the DVDs is just lying loose because a piece of the disk holder broke off. But it's not that big of a deal! Would recommend!! 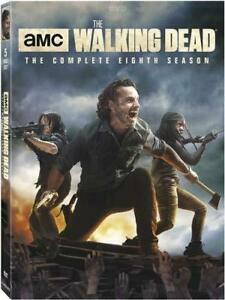 My sister asked me to order this for her because she's addicted to The Walking Dead series.She'd finished watching season seven and couldn't wait to watch season 8.She absolutely Loved it and said the more she watched the better it got.She can't hardly wait now for season 9.She Loves this series and said anyone would Love it. I absolutely LOVE The Walking Dead series! I have every one that's been released so far. It's an extremely engaging and entertaining show. You just can't wait to watch the next one! I will be a sad, sad, sad person when/if the series ever ends. Huge Walking Dead fan. My son is also. We now have every season on DVD.